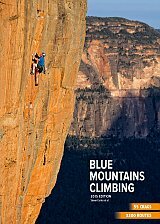 This is the 2015 edition of the comprehensive Blue Mountains Climbing guidebook. It is every climber's essential companion to one of Australia's most popular climbing areas. Extensive coverage of the region combined with quality information make it key to maximising your enjoyment of this huge climbing area. The book details some 3200 routes at 55 crags. There are hundreds of action and cliff topo photographs and access maps for every crag. This new edition incorporates vast amounts of important new and updated route information, as well as some important new access information. But this new edition is much much more than just an update to the 2010 Edition! Two main reasons for that: * Firstly, it describes 500 more routes than the 2010 edition. Some of these routes are at the seven new areas described (The Pit, Elphinstone, Red Point, The Nest, The Soft Parade, Bell and Dalpura Head) and some of them are at existing areas. For example, Sublime Point has seen the addition of over 50 new routes! * Secondly, this book has been completely redesigned and reformatted. Hundreds of hours of work have gone into the redesign but we felt it was worth it for the improved usability that has resulted. A slightly larger and clearer font has improved readability, and the new two column layout conveys information more clearly; the redesign has enabled these things without significantly increasing the page count. Other changes include the simplification of the route colour coding (to indicate sport, mixed and trad routes), all routes that require bolt brackets are indicated by a symbol, and the use of a four-star system to indicate quality. All good changes for sure.